The tanks are gearing up around New York City for their annual Mitzvah campaign in honor and memory of Rabbi Schneerson. Armed with megaphones and young bearded men clad in white shirts, black pants, and black hats; they are looking to bring goodness into the world. 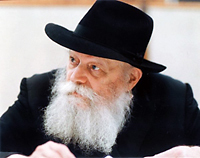 Sunday, July 6, the Hebrew date of Gimmel Tammuz, marks the 14th anniversary of the passing of the Lubavitcher Rebbe, Rabbi Menachem Mendel Schneerson. As the seventh leader in the Chabad-Lubavitch dynasty, he is hailed to be the driving force behind the stirring and reawakening of the spiritual consciousness of Jews worldwide. Born in 1902, in Nikolaev, Russia, Rabbi Schneerson, known simply as “the Rebbe” to his followers, immediately began his lifelong mission. His mission was dominated by his desire to aid those whose lives were in danger, Jews drowning in the pool of assimilation, ignorance, and alienation. Rabbi Schneerson ascended to his role as leader of the Chabad-Lubavitch movement in 1950, shortly after the passing of his father-in-law, Rabbi Yosef Yitzchak Schneerson, the sixth Rebbe in the Chassidic dynasty. From 770 Eastern Parkway in Brooklyn, New York, he urged his followers to go out into the world and elevate it. He taught that there is light everywhere; that it just needs to be unearthed from the darkness enveloping it. Armed with his inspired teachings, kind encouragement, and plentiful blessings, “that there is not a single Jew, as far as he may seem or thought himself to have drifted from the center of Yiddishkeit [Judaism], who does not have some good point, some particular mitzvah which by nature or by inclination he may promote,” institutions reached greater heights. Outreach took on new dimensions as Chabad houses opened worldwide, from Munster, Indiana to Thailand and Singapore. Around the globe, people were reminded of their Jewish roots, and were given the opportunity to do a mitzvah, a good deed. Mitzvot took on greater universal meaning when Rabbi Schneerson began this “mitzvah campaign”. Before then, a mitzvah was considered to be a private deed performed by a religious Jew. With his mitzvah campaign, the Rebbe gave every Jew, no matter his religious or spiritual standing, the opportunity to connect to God. His viewpoint; that each mitzvah is of infinite value unto itself, regardless of whether it was part of the entire “religious package” or not. Rabbi Schneerson would quote Maimonides and say that a single person performing just one mitzvah could be what will ultimately tip the scales and bring redemption to the world. He therefore campaigned strongly and issued a call to every Jew, wherever they may be and whichever spiritual state they find themselves in, to do a mitzvah. With his emissaries living throughout the world, Rabbi Schneerson did in fact bring Torah knowledge and observance to those who would have never been exposed to it otherwise. From Chabad-Lubavitch headquarters in Crown Heights, Brooklyn the Rebbe was a light unto his people. He was leader who had a great sensitivity toward the past, both history and tradition; was able to recognize the need of the moment, respond accordingly, and give proper direction; he also had an immense foresight into the future, and was able to prepare for the many tomorrows. In the early morning hours of June 12, 1994, Rabbi Schneerson passed away, leaving a multitudinous following orphaned. Rabbi Schneerson’s life was about helping others; humbly putting others’ needs before his own. Through all hours of the day, and night, he would be at work, attempting to bring about change in the world, to reveal its innate goodness. To commemorate his passing, his followers strive to continue in their sacred leader’s path. They therefore dedicate the day to carry out their Rebbe’s mission full force. Pooling their resources together, they continue his “mitzvah campaign.” Dozens of tanks, fondly dubbed “mitzvah tanks,” drive around the city. With megaphones fixed atop, they call out to fellow Jews, urging them to come aboard and do a mitzvah. Throughout the day, they help men don tefillin, many for the first time since their Bar Mitzvah; others give charity, make a blessing over food, and receive Shabbat candles. And that is what Gimmel Tammuz is about, good deeds. It is a day that was once filled with many tears, but now a deep sense of purpose has taken their place. As Rabbi Schneerson himself would say when referring to his father-in-law, that there is no better commemoration and glorification than to continue with your leader’s work, thus building a legacy that will last forever; one that is not bound to such things as material dates.